The primary cilium has an important role in signaling; defects in structure are associated with a variety of human diseases. Much of the most basic biology of this organelle is poorly understood, even basic mechanisms, such as control of growth and resorption. We show that the activity of the anaphase-promoting complex (APC), an E3 that regulates the onset of anaphase, destabilizes axonemal microtubules in the primary cilium. Furthermore, the metaphase APC co-activator, Cdc20, is specifically recruited to the basal body of primary cilia. Inhibition of APC-Cdc20 activity increases the ciliary length, while overexpression of Cdc20 suppresses cilium formation. APC-Cdc20 activity is required for the timely resorption of the cilium after serum stimulation. In addition, APC regulates the stability of axonemal microtubules through targeting Nek1, the ciliary kinase, for proteolysis. These data demonstrate a novel function of APC beyond cell cycle control and implicate critical role of ubiquitin-mediated proteolysis in ciliary disassembly. The majority of cells in the human body have small hair-like structures that project from the cell surface. These structures, known as primary cilia, are involved in sensing light and touch, and they are also required for an organism to develop normally. Defects in cilia result in a wide range of human diseases that are collectively known as ciliopathies. These include polycystic kidney disease and Bardet–Biedl syndrome. Ciliary disorders can also affect almost every organ in the body leading to blindness, obesity, diabetes, and cancer. Cilia are dynamic structures that are dis-assembled when cells start to divide and are then re-assembled when cells are quiescent. The anaphase promoting complex (APC) has a critical role during cell division and targets key proteins that need to be degraded at specific times during this process. APC is localized in the basal body, which is found at the bottom of cilia, and it works together with a number of proteins which assist its function. Wang et al. now report that a complex formed by APC and its co-activator protein Cdc20 has two functions at the basal body: it is needed to maintain the optimal length of the cilia in quiescent cells and to shorten the cilia when cells exit from quiescent stage. Wang et al. also investigated the role of Nek1, an enzyme that is localised in the basal body. It was found that reducing the level of Nek1 in quiescent cells resulted in the formation of defective cilia, suggesting that this enzyme controls the stability and integrity of cilia. Moreover, when cells undergo division, the APC-Cdc20 complex targets the Nek1 enzyme, causing it to be degraded and allowing the cilia to be disassembled. A detailed understanding of how cells maintain the length of cilia could lead to the development of new approaches for the treatment of human ciliopathies. The primary cilium is a non-motile microtubule-based organelle, organized by the mother centriole (basal body). Though known for over a century, it received little interest until it was appreciated that it is highly enriched in receptors for various signaling pathways, including PDGF, calcium, receptor tyrosine kinases, Wnt, and Hh (Satir et al., 2010). The assembly of primary cilium is coupled to cell cycle exit and entry into quiescence. The primary cilium functions as a tumor suppressor organelle that regulates cell proliferation and differentiation (Pan et al., 2012). Dysfunctions of the primary cilium cause a set of human diseases, classified as ciliopathies, such as polycystic kidney diseases (Hildebrandt et al., 2011). Cancers are also associated with the loss of cilia, due to misregulated cell proliferation through ciliary signaling (Plotnikova et al., 2008). Ciliopathies are highly associated with defective ciliogenesis and abnormal ciliary length. The assembly/disassembly of cilia and maintenance of ciliary length are tightly regulated through control of intraflagellar transport (IFT) and axoneme modification (Avasthi and Marshall, 2011). Ciliary length is regulated by the balance of the bidirectional transport of microtubule subunits and associated protein complexes through IFT (Pedersen and Rosenbaum, 2008). Importantly, the extension/resorption of primary cilia also involves changes of the stability of axonemal microtubules, which are controlled by post-translational modifications. For example, Aurora kinases stimulate disassembly of cilia and flagella by phosphorylation and activation of tubulin deacetylase (Pan et al., 2004; Pugacheva et al., 2007). Another key post-translational modification during ciliogenesis is ubiquitylation. In Chlamydomonas flagella, there is an increase in the levels of protein ubiquitylation during flagellar resorption (Huang et al., 2009). However, the precise mechanism for how ubiquitylation might control the process of ciliogenesis is not known. It is curious that many mitotic regulators have been found to be involved in ciliogenesis, such as Aurora A kinase (Pugacheva et al., 2007) and NIMA-related kinases (Moniz et al., 2011). Recently, it was shown that anaphase-promoting complex (APC), the key ubiquitin E3 ligase that governs cell cycle progression is localized to the basal body of the motile cilia in multiciliated Xenopus epidermal cells, where it has some role in regulating ciliary polarity (Ganner et al., 2009). In mitosis, APC sequentially recruits co-activators (Cdc20 followed by Cdh1) and cooperates with two specific E2s (UBCH10 and Ube2S) to control proteolysis of key regulators of the metaphase to anaphase transition (Fujita et al., 2009; Fujita et al., 2009). APC also has a less well understood role in regulating other cellular processes, such as neurogenesis, metabolism, and myogenesis (Kim et al., 2009; Eguren et al., 2011). In mitosis, the activity of APC-Cdc20 is tightly controlled at multiple levels. Regulation of phosphorylation of APC subunits and Cdc20 is essential for the timing of APC activation during mitotic progression (Kramer et al., 2000); APC-Cdc20 is also modulated by its inhibitor proteins (Luo et al., 2000; Madgwick et al., 2006). In addition, protein levels of APC cognate E2s, UBCH10 and Ube2S are crucial for the activation of APC-Cdc20, and play a role in the override of mitotic arrest (Reddy et al., 2007; Garnett et al., 2009). Although the function and regulation of APC-Cdc20 during mitosis and meiosis is thoroughly studied (Kramer et al., 2000; Madgwick et al., 2006), the non-mitotic roles of APC-Cdc20 remain largely unknown. It was recently found that APC-Cdc20 is localized to the centrosome of postmitotic neurons and plays an important role in dendrite morphogenesis (Kim et al., 2009). It would therefore be of interest to explore the potential activity of Cdc20 in quiescent and differentiated cells. All of this circumstantial evidence suggests that there may be a value in investigating whether APC has a broad regulatory role in the primary cilium. We report here that APC-Cdc20 is central to the regulation of the primary cilium. The APC is localized to the basal body of primary cilia of human epithelial cells, where it negatively controls the length and stability of the axonemal microtubules. During exit from the quiescent (G0) state APC-Cdc20 is activated and drives ciliary resorption. Given the well-established role for APC in dividing cells, we are interested in whether APC is still active and what role it might have in quiescent ciliated cells. Human hTERT-RPE1 cell line is an established model to study the assembly/disassembly of primary cilia (Pugacheva et al., 2007). Greater than 80% of RPE1 cells are ciliated after serum-starvation for 48 hr, and disassembly of primary cilia occurs 1–2 hr after re-adding serum. We found that APC is still active in cytoplasmic extracts of quiescent ciliated RPE1, using the canonical APC substrate Securin (Figure 1—figure supplement 1). Immunostaining showed that APC subunit 2 (APC2) is localized to the basal body of the ciliated cells (Figure 1A and Figure 1—figure supplement 2A), consistent with the previous report that APC is localized to the basal body of motile cilia in the Xenopus epidermis (Ganner et al., 2009). Co-localization of APC2 with dynactin subunit P150 (Guo et al., 2006) further confirmed its localization to the mother centriole (Figure 1—figure supplement 2B and 2C). Furthermore, we found that the APC co-activator Cdc20 is also localized to basal body of the primary cilium (Figure 1B), whereas Cdh1 did not show such localization (Figure1—figure supplement 3). Interestingly, Cdc20 was not observed at the centrosome of cycling interphase non-ciliated cells (Figure 1B and Figure1—figure supplement 2D), indicating that Cdc20 is specifically recruited to the basal body during ciliogenesis, rather than generally binding to the interphase centrosome. Western blotting showed that Cdc20 protein levels are dramatically reduced after serum starvation for 24 hr, due to the exit of cells from proliferation (Figure 1—figure supplement 2E). Importantly, Cdc20 protein levels were significantly elevated at 48 hr after serum starvation, when >80% of the cells are ciliated, consistent with the appearance of this protein at the basal body. Thus, our data suggest that APC-Cdc20 may have a special role at the basal body after initiation of ciliogenesis. APC-Cdc20 is localized to the basal body of the primary cilium. (A) Subconfluent hTERT-RPE1 cells were serum starved for 48 hr, fixed, and stained for APC subunit 2 (APC2, red), acetylated tubulin (green) and DNA (blue). (B) Proliferating interphase RPE1 cells, serum starved cells, and quiescent cells after serum stimulation were fixed and stained for Cdc20 (red), acetylated tubulin (green), and DNA (blue). Boxes in main images indicate structures shown at higher magnification to right. The scale bars in this figure represent 10 μm. We then tested whether Cdc20 is required for some aspect of ciliogenesis. Reduction of APC subunit 2 (APC2) by siRNA significantly increased the length of primary cilia marked by acetylated tubulin staining (Figure 2A–C). Consistently, the depletion of Cdc20 by siRNA had no effect on the percentage of ciliated cells, but there was a significant increase in the ciliary length (Figure 2D–F). Negative Ki-67 staining demonstrated that these ciliated cells after the knockdown of either APC2 or Cdc20 are still in quiescent stage (Figure 2—figure supplement 1A). In contrast, knockdown of Cdh1 by siRNA gave no obvious ciliary phenotype (Figure 2—figure supplement 2A). This result is contradictory to a previous study proposing that APC-Cdh1 promote ciliogenesis (Miyamoto et al., 2011). Reciprocally, we asked what the effect would be for overexpression of Cdc20. When we transiently transfected cells with plasmid encoding Cdc20-GFP, we found it localized to the centrosome of quiescent cells, and completely suppressed the formation of primary cilia (Figure 2G,H). This phenotype was confirmed by Immunostaining of Arl13b, another specific marker for ciliary axoneme (Figure 2—figure supplement 2B). These results suggested that Cdc20 negatively controls the length of the primary cilium. APC-Cdc20 negatively regulates the length of primary cilia. (A and D) RPE1 cells were treated with control siRNA or siRNA targeting APC2 or Cdc20 respectively, serum starved for 48 hr, and stained for acetylated tubulin (green) and DNA (blue). The scale bar represents 10 μm. (B and E) Western blot showed knockdown efficiency of siRNA treatment against Cdc20 and APc2. (C and F) Ciliary length was measured from ciliated cells based on acetylated-tubulin staining (n > 30). Data are means ±S.D. p <0.005. (G) RPE1 cells were transiently transfected with vectors expressing GFP (green) or Cdc20-GFP (green) respectively, serum starved for 48 hr, and were stained for acetylated tubulin (red) and DNA (blue). The scale bar represents 5 μm. (H) Percentage of ciliated cells was obtained from five independent experiments. An average of 100 cells was counted in each of the experiments. Data are means ±S.D. To further validate the effect of Cdc20, we used a small molecule inhibitor of APC, proTAME. Previous studies showed that cell-permeable proTAME efficiently inhibits the APC activity through disruption of the association of APC with its co-activators (Zeng et al., 2010; Zeng and King, 2012). The advantage of small molecule inhibition over RNAi is that proTAME exerts its inhibitory effect immediately after drug treatment, which helps differentiate the ciliary phenotype from the possible secondary effect caused by impaired cell cycle control. The length of preformed cilia was increased from 4µm to 7µm after treatment of fully ciliated quiescent cells with proTAME for 3 hr (Figure 3), consistent with the Cdc20 knockdown or APC2 knockdown phenotype. Negative Ki-67 staining shows that the ciliated cells are still in quiescent stage after short-term treatment with this drug (Figure 2—figure supplement 1B). This result supports the view that the activity of APC is required for maintaining the proper length of primary cilia. Treatment of ciliated cells with proTAME increased the ciliary length. RPE1 cells were serum-starved for 60 hr and further starved for 3 hr in the presence of DMSO or 20 μM proTAME before staining for acetylated-tubulin (green) and DNA (blue). Ciliary length was measured from ciliated cells based on acetylated-tubulin staining (n > 30). Data are means ±S.D. p <0.001. The scale bar: 10 μm. These observations suggested that activation of APC-Cdc20 might be responsible for the destabilization and shortening of ciliary axoneme when quiescent cells re-enter the cell cycle. To test this hypothesis, we treated serum-starved cells with proTAME when adding serum; serum causes ciliary resorption and subsequent re-entry into the cell cycle. Primary cilia on DMSO-treated control cells significantly shortened and resorbed 4 hr after serum addition. ProTAME treatment delayed the shortening and resorption of cilia (Figure 4A,B), demonstrating that APC activity is required for efficient ciliary resorption before the exit of cells from quiescent phase. Suppression of either Cdc20 or APC2 by siRNA also significantly delayed ciliary shortening (Figure 4—figure supplement 1). Calcium influx is known to be necessary and sufficient for shortening and resorption of the primary cilium (Besschetnova et al., 2010; Plotnikova et al., 2012), and we found that proTAME treatment also prevented ciliary shortening induced by Calcium ionophore treatment (Figure 4—figure supplement 2A and 2B). Based on these results, APC-Cdc20 at the basal body has two related functions: it maintains cilium length of quiescent cells; it is required for shortening and resorption of the cilium. Inhibition of APC activity prevented proper ciliary resorption post serum stimulation. (A) Quiescent ciliated RPE1 cells were treated with serum containing either DMSO or 20 μM proTAME for 4 hr, fixed and stained for acetylated tubulin (green) and DNA (blue). Scale bar: 10 μm. (B) Quantitation of ciliary length and ciliation of DMSO or proTAME treated cells after serum stimulation. Ciliary length was measured from ciliated cells (n > 30) (*p <0.001); the percentage of ciliated cells was obtained from five independent experiments. Data are means ±S.D. (C) Cells were treated with control siRNA or Ube2S targeting siRNA and were serum starved for 2 days in the presence of siRNA. Cilia were quantitated after release of cells from starvation for 4 hr. Ciliary length was measured from ciliated cells (n > 30) (*p <0.001); the percentage of ciliated cells was obtained from five independent experiments. Data are means ±S.D. Regulation of APC in mitosis employs a special E2 enzyme, Ube2S, which elongates ubiquitin chains on a substrate through specific linkages at the K-11 position of ubiquitin (Williamson et al., 2009; Wu et al., 2010). Ube2S keeps APC partially active during mitotic arrest and is required to fully activate APC-Cdc20 (Garnett et al., 2009). We were interested in whether Ube2S is also involved in regulation of APC-Cdc20 during ciliogenesis. We found that depletion of Ube2S increased the cilium length in quiescent cells (Figure 4—figure supplement 3) and delayed ciliary shortening and resorption upon either serum stimulation or calcium influx (Figure 4C; Figure 4—figure supplement 2C). These data imply that the cell utilizes the general processes for regulation of APC-Cdc20 activity for both mitosis and ciliogenesis. In mitosis APC ubiquitylates specific regulatory molecules like cyclin B and securin that control the processes of the metaphase–anaphase transition. Similarly, there should be substrates of APC that might regulate the stability of the ciliary axoneme. Aurora-A, a known APC substrate during late mitosis, plays an important role in regulating disassembly of primary cilium (Pugacheva et al., 2007). We showed that protein levels of Aurora-A do not decrease upon serum stimulation when APC-Cdc20 is activated (Figure 5—figure supplement 1A), consistent with the previous report (Pugacheva et al., 2007). This may be explained by previous studies showing that during ciliogenesis, Aurora-A is autophosphorylated at S51 (Plotnikova et al., 2012), which protects it from APC-mediated degradation (Littlepage and Ruderman, 2002; Littlepage et al., 2002). Accordingly, the knockdown of Cdc20 in quiescent cells did not affect Aurora-A protein levels (Figure 5—figure supplement 1B). It was indicated by recent studies that APC may regulate ciliogenesis through degradation of dishevelled protein (Ganner et al., 2009; Miyamoto et al., 2011). However, both specific ubiquitylation assay and in vitro degradation assay showed that dishevelled is not an authentic substrate of APC (Figure 5—figure supplement 1C and 1D), contradictory to their argument. Nek1, the founding member of the NIMA-related kinase family was a good candidate. Genetic mutation in Nek1 was highly associated with short-rib polydactyly syndrome Type Majewski, a new ciliopathy (Thiel et al., 2011), and Nek1 is localized to the basal body region (Shalom et al., 2008). Both human and mouse fibroblast cells with Nek1 mutations have cilia with abnormal branched structures (Shalom et al., 2008; Thiel et al., 2011). We found that the depletion of endogenous Nek1 by siRNA in serum-starved RPE1 cells generated cilia with branched structures, revealed by acetylated-tubulin staining (Figure 5A–C and Figure 5—figure supplement 2A), indicating that Nek1 controls the stability and integrity of axonemal microtubules. 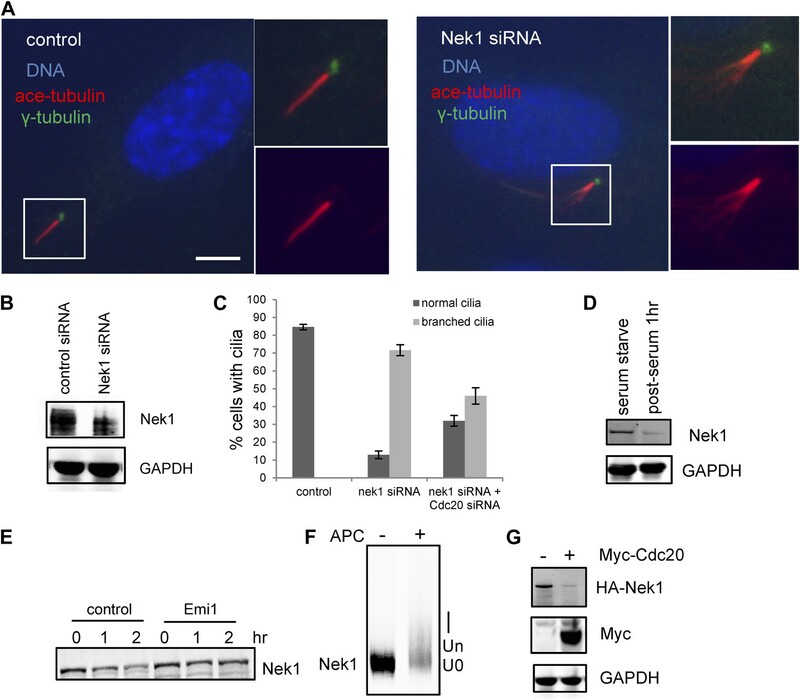 Nek1 knockdown in proliferating RPE1 cells did not affect the structure of either cytoplasmic-acetylated tubulin in microtubules or centrosomal gamma-tubulin (Figure 5—figure supplement 2C), suggesting a specific and confined role of Nek1 in ciliogenesis. After serum addition, the branched structure can still be efficiently resorbed (Figure 5—figure supplement 2B), consistent with the dynamics of ciliary disassembly, indicating that the branched structure is ciliary axoneme. We found that Nek1 levels decreased after serum stimulation (Figure 5D), suggesting that the degradation of Nek1 could be essential for triggering the destabilization of the primary cilium. Finally, Nek1 also has a canonical destruction box (RXXLXXXN), the APC recognition motif, right after its coiled-coil domain. We showed by degradation assays in vitro that Nek1 is degraded in HeLa cell extracts, and that this degradation can be suppressed by Emi1, a specific APC inhibitor protein (Figure 5E). Nek1 is efficiently ubiquitylated by APC in in vitro ubiquitylation assay involving purified APC (Figure 5F). Furthermore, overexpression of Cdc20 leads to reduction of Nek1 levels in quiescent RPE1 cells (Figure 5G). These results validate Nek1 as an APC substrate. Moreover, simultaneous depletion of Cdc20 and Nek1 partially rescued the branched cilia phenotype caused by Nek1 knockdown (Figure 5C), suggesting that APC-Cdc20 regulates the stability of ciliary axoneme at least in part through antagonizing Nek1 activity. Nek1 is the substrate of APC-Cdc20 for the regulation of the structure of primary cilia. (A) RPE1 cells were treated with control siRNA or Nek1 targeting siRNA, serum starved for 48 hr, and stained for acetylated tubulin (red), γ-tubulin (green) and DNA (blue). Scale bar represents 5 μm. (B) siRNA-treated cells were subjected to Western blot for endogenous Nek1 and GAPDH. (C) Cells were transfected with control siRNA, Nek1 siRNA, or Nek1 siRNA together with Cdc20 siRNA respectively, serum starved for 2 days, and stained for acetylated tubulin. The percentage of cells with normal cilia or branched abnormal cilia was calculated from three independent experiments. Data are means ±S.D. (D) Western blot showed the decrease of Nek1 protein levels after serum stimulation. (E) Degradation of 35S-labelled Nek1 was examined in cell extracts prepared from HeLa S3 cells. Emi1 was added to test if the degradation was dependent on APC activity. The data were analyzed by autoradiography. (F) HA-tagged Nek1 was expressed and labeled with 35S in reticulocyte lysate. 35S-labelled Nek1 was purified through HA tag and subjected to in vitro ubiquitylation catalyzed by purified APC. (G) RPE1 cells were transfected with plasmid expressing HA-Nek1 and/or Myc-Cdc20, starved for 2 days and subjected to western blot for Myc tag, HA tag, and GAPDH. The assembly, maintenance, and disassembly of the primary cilium are regulated by the control of intraflagellar transport and protein posttranslational modifications (Besschetnova et al., 2010). Impairment of ciliary length control and ciliary assembly can lead to inappropriate cell proliferation and defects in signal transduction, causing ciliopathies and perhaps tumorigenesis. Though more and more is understood about which proteins control ciliary function, much of it through human genetics, much less is known about regulatory features that control the timing of ciliogenesis, and with respect to our work here, ciliary resorption. Surprisingly, some of the machinery for regulation is very similar to that used in regulation of the mitotic cycle, which depends significantly on posttranslational modifications. In particular the mitotic process in cells is controlled from the top by the activation of a kinase, Cdk1-cyclin B and an E3 component of the ubiquitin pathway, APC-Cdc20 and APC-Cdh1. We have found that the same Cdc20 is recruited to the basal body of the primary cilium, where in complex with APC it negatively regulates ciliary length, by destabilizing axonemal microtubules. Following serum stimulation of quiescent cells, APC-Cdc20 is fully activated leading to ciliary shortening and resorption. A previous study in this area claimed that APC-Cdh1 promoted the assembly of primary cilia; a conclusion completely contrary to our results. Although they found, as we did (Figure 2D–F), that Cdc20 knockdown promotes ciliogenesis, they explained it by assuming that Cdc20 is an inhibitor of APC-Cdh1, and that Cdc20 needs to be degraded for the activation of APC-Cdh1 to promote the assembly of cilia (Miyamoto et al., 2011). They also proposed that APC-Cdh1, but not Cdc20, specifically degrades dishevelled during ciliogenesis. There are several problems with their data and conclusions. We found that Cdc20 is recruited to the basal body of fully formed primary cilia, and there is no evidence for the presence of Cdh1 at the basal body (Figure 1B and Figure 1—figure supplement 3). Knockdown of Cdh1 does not inhibit the assembly of cilia, contradictory to their model (Figure 2—figure supplement 2A). In addition, depletion of APC subunit (APC2) or treatment of ciliated cells with proTAME, which inhibits APC through promoting dissociation of both Cdc20 and Cdh1, increases (and not decreases) ciliary length (Figure 2A–C and Figure 3), consistent with the Cdc20 knockdown phenotype. There is no precedent for Cdc20 functioning as an inhibitor of Cdh1 in mitosis. Instead, APC-Cdh1 ubiquitylates Cdc20, leading to its rapid disappearance during anaphase (Pfleger and Kirschner, 2000). Finally, we showed that dishevelled is not an authentic substrate of APC-Cdh1 using both specific ubiquitylation assays and degradation assays in vitro (Figure 5—figure supplement 1C and 1D). Thus, our data argue against their model and instead point to the role of APC-Cdc20 in negatively regulating ciliogenesis. Furthermore, our data show that APC-Cdc20 counteracts the Nek1 activity to regulate the stability of the ciliary axoneme during maintenance and resorption of cilia. Depletion of Nek1 resulted in branched axonemal microtubules. An explanation for this phenotype is that the function of Nek1 is to stabilize axonemal microtubules. Thus, depletion of Nek1 leads to the destabilization and disassembly of axonemal subunits. It would appear that the disassembled axonemal subunits cannot be transported out of cilia efficiently, and instead they are randomly reassembled in the ciliary lumen, resulting in branched and frayed structures. Depletion of Nek1 also results in defects in ciliary signaling, revealed by the absence of Arl13b staining (Figure 5—figure supplement 2A). This indicates that proper regulation of APC-Cdc20 activity is also essential for normal cellular signaling through primary cilia. We note that APC may control the degradation of a series of ciliary proteins besides Nek1, as this E3 ligase does during mitosis. It will be interesting to try to identify other known and unknown APC substrates in the primary cilium and determine how they are regulated during the process of elongation and resorption. The regulation of APC activity during mitosis and meiosis is controlled by the activity of kinases, such as Cdk1 (Kramer at al., 2000; Madgwick et al., 2006). Our preliminary data showed that suppression of Cdk activity increased the ciliary length (unpublished data), consistent with the role of Cdk1 in stimulating APC activity as in mitosis/meiosis. It is also possible that some protein inhibitor of APC is involved in ciliogenesis, regulating the suppression and activation of APC activity during ciliary maintenance and disassembly respectively. It is worthwhile to further dissect the detailed mechanism underlying this process in the future study. The regulation of the primary cilium has assumed a great importance in overall cellular regulation and disease. The assembly/disassembly of primary cilium is under strict homeostatic control, and it is responsive to cell cycle regulation. The regulatory apparatus bears great similarities to the posttranslational control in the mitotic cycle. Despite the known presence of many of the same components that were thought to be quintessential components of the mitotic engine, it was not clear that their function bears strong similarities to their use in the cell cycle. Central to mitosis is this is the anaphase-promoting complex and its metaphase/anaphase regulator Cdc20. It acts as a master regulator of downstream kinases and phosphatases but it also targets terminal protein substrates. The primary cilium is thought to be a concentrated signaling system whose length may therefore act as a rheostat controlling a complement of signaling activities in cells. It therefore becomes attractive to think of ways of perturbing ciliary length. As more and more evidence accumulates documenting the connection between defects in ciliogenesis and human diseases, there could be a growing interest need for new therapies that modulate ciliary length and ciliary disassembly. An understanding of the central role of the APC in control of ciliary length could aid in the identification of new drug targets that may have broad applicability. hTERT-RPE1 cells were grown in Dulbecco's Modified Eagle Medium (DMEM) with 10% fetal bovine serum (FBS). For analysis of ciliary assembly, cells were plated at subconfluence on glass coverslips and starved for 48 hr in DMEM without serum to induce cilia formation. To induce ciliary resorption, starved ciliated cells at subconfluence were treated with DMEM medium with 10% serum for 1–4 hr. Plasmids were transiently transfected into cells with FuGENE 6 Transfection Reagent (Promega, Madison, WI). For siRNA treatment, cells were transfected with indicated siRNA by Lipofectamine RNAiMAX Transfection Reagent (Life Technologies, Beverly, MA). Plasmids from the laboratory stock are as follows: human securin, human HA-Nek1, GFP, human Cdc20-GFP, human cMyc-Cdc20, and human DVL in pCS2 vector. SMARTpool ON-TARGETplus siRNA for Nek1 and Cdc20 were obtained from Thermo scientific, Waltham, MA. Silencer Select siRNA for Ube2S were obtained from Life Technologies. Calcium ionophore was from Sigma, St. Louis, MO. proTAME was from Boston Biochem, Cambridge, MA. Recombinant Emi1 and APC components are purified as previously described (Wang and Kirschner, 2013). Securin and HA-Nek1 were expressed and radiolabelled with 35S in reticulocyte lysate (Promega). HA-Nek1 was further purified through HA beads (Sigma) for ubiquitylation assay. Cell extracts were prepared from HeLa S3 cells and RPE1 cells as indicated. In vitro protein degradation and in vitro ubiquitylation assays were performed as described previously (Wang and Kirschner, 2013). hTERT-RPE1 cells were lysed in SDS sample buffer, and proteins were separated by SDS-PAGE on 4–12% gel. Data were analyzed with the Odyssey Infra-red imaging system. Primary antibodies for western blot were as follows: anti-GAPDH (1:20,000; 0411; sc47724; Santa Cruz Biotech, Santa Cruz, CA), anti-Nek1 (1:100; PAB3282; Abnova, Taiwan), anti-c-Myc (1:500; 9E10; sc40; Santa Cruz Biotech), anti-HA (1:500; Y11; sc805; Santa Cruz Biotech), anti-Ube2S (1:1000; 2257; Strategic Diagnostics, Newark, DE), anti-actin (1:2000; A2066; Sigma), anti-Aurora A (1:1000; 3092; Cell Signaling, Beverly, MA), anti-Cdc20 (1:1000; AR12; K0140-3; MBL International, Woburn, MA). Infrared secondary antibodies (1:20,000; Li-COR Biosciences, Lincoln, NE) were used for Odyssey imaging. Cells on coverslips were fixed with 3.5% paraformaldehyde (10 min) at 37°C and then methanol (4 min) at 4°C, permeabilized with 0.2% Triton-X100 in PBS, blocked in 2.5% BSA in PBS, and incubated with antibodies. Alternatively, to optimize signals at centrosomes or basal bodies, cells were fixed in methanol at −20°C for 10 min and subjected to blocking and antibody incubation. Primary antibodies included anti-APC2 (1:50; home-made), anti-APC7 (1:50; 21,418; Santa Cruz Biotech), anti-Cdc20 (1:100; AR12; K0140-3; MBL International), anti-γ-tubulin (1:5000; T5192; Sigma), anti-acetylated tubulin (K40) (1:2000; 6-11B-1; T7451; Sigma), anti-acetylated tubulin (K40) (1:2000; D20G3; 5335; Cell Signaling), anti-p150Glued (1:100; 1/p150Glued; 610473; BD Biosciences, San Jose, CA), anti-Arl13b (1:500; 17,711-1-AP; Proteintech, Chicago, IL), anti-ki-67 (1:500; ab15580; Abcam, Cambridge, MA), anti-centrin 1 (1:200; ab11257; Abcam), anti-Cdh1 (1:100; home-made), anti-Cdh1 (1:200; Ab-2; Calbiochem), anti-Cdh1 (1:200; 34-2000; Life Technologies). Secondary antibodies labeled with Alexa 488 and Alexa 568 were from Life Technologies. DNA was stained with DAPI. Images were acquired with Nikon 80i Upright Microscope, and processed with MetaMorph image acquisition software and Adobe Photoshop SC3. In order to measure the length of cilia, during coverslip mounting, the coverslips were pressed hard against microscope slides to flatten most of the cilia. Only those cilia which were flattened into one plane were selected for image acquirement and length measurement. Seminars in Cell & Developmental Biology 22:572–578. International Journal of cancer 125:826–836. Proceedings of the National Academy of Sciences of USA 106:17799–17804. Molecular Biology of the Cell 17:680–689. The New England journal of medicine 364:1533–1543. The Journal of Cell Biology 186:601–613. Molecular Biology of the Cell 11:1555–1569. Proceedings of the National Academy of Sciences of USA 99:15440–15445. The Journal of Cell Biology 174:791–801. Cellular and Molecular Life Sciences 70:1849–1874. Current Topics in Developmental Biology 85:23–61. Molecular Biology of the Cell 23:2658–2670. Journal of Cell Science 123:499–503. American Journal of Human Genetics 88:106–114. Proceedings of the National Academy of Sciences of USA 106:18213–18218. Proceedings of the National of Academy of Sciences of USA 107:1355–1360. Thank you for sending your work entitled “APC-Cdc20 regulates ciliary length and disassembly of the primary cilium” for consideration at eLife. Your article has been favorably evaluated by Randy Schekman (Senior editor) and 3 reviewers, one of whom is a member of our Board of Reviewing Editors. Your study focuses on the regulation of primary cilium length, and reabsorption. 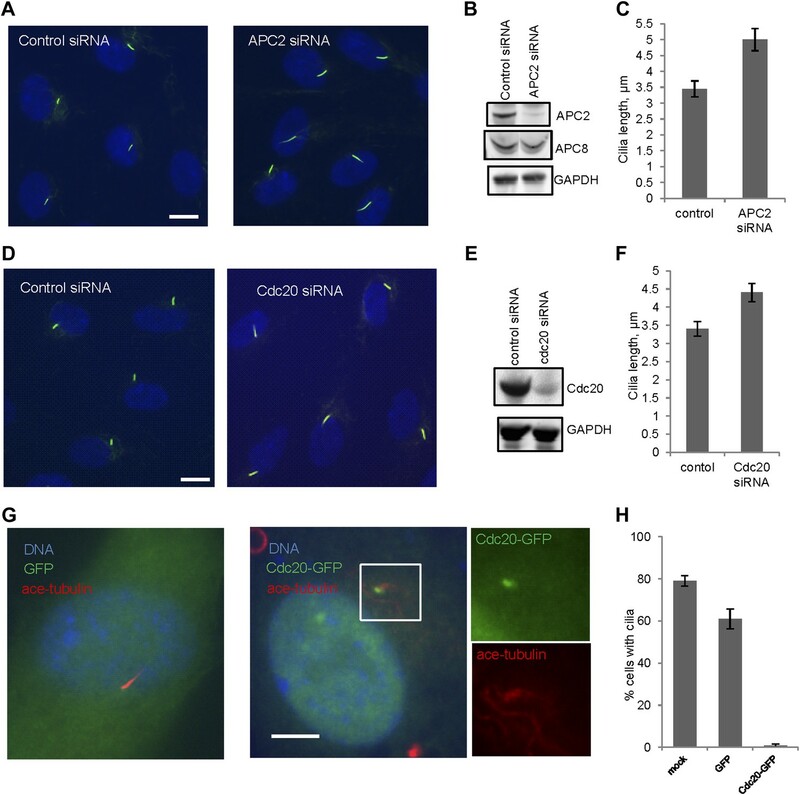 This is a poorly understood area of cilium biology, and this work provides novel and interesting insights into a mechanism involving the anaphase-promoting complex APC/Cdc20. You confirm a previous study that APC/Cdc20 localize to the ciliary basal body. Using specific inhibitors, siRNAs and over-expression they then show that the APC/Cdc20 complex is required for controlling cilium length, and reabsorption upon serum-induced re-entry into the cell cycle. Significantly you show that the ciliary kinase Nek1 is an APC/Cdc20 substrate. Furthermore, the study addresses some inconsistencies in previous studies. Despite these overall positive comments, the reviewers agreed that there are flaws in your study that need to be addressed before it is considered further. 1) It is clear from the Discussion that the work is in contradiction to a prior study addressing the roles of APC, Cdc20, and Cdh1. However, because these issues are not raised until the Discussion, the presentation of data is not structured to rigorously allow critique of the prior work: many additional controls, and performance of side-by-side comparison of Cdc20 with Cdh1 throughout the work, would be necessary if this is the main point to be made. For example, it is stated that Cdh1 is not localized at the basal body, contrary to a previous study. However, the experimental conditions and antibodies used in your study are not discussed (were different antibodies used? ), nor is there discussion of disheveled or its relevance to cilia in the main text. For example, it would be important to show parallel data for all experiments with Cdh1, rather than stating as unpublished data that the knockdown of this protein gave no ciliary effect. These data should include evidence that efficient knockdown was achieved. If you do not wish to do these experiments, then the discussion should be modified. 2) Some of the data do not support the interpretation of observed results, particularly with Nek1, and some simple but important control experiments are missing. For example, if the action of Cdc20 is to promote Nek1 degradation, then overexpression of Nek1 or Nek1 with a mutated recognition sequence for APC should lengthen cilia under steady state conditions, or prevent ciliary resorption following induction of disassembly. This experiment would test your model directly. 3) It is not clear how APC/Cdc20 activity is regulated – of particular importance is the finding that the level of at least Cdc20 is high at 48 hr serum starvation (Figure 1–figure supplement 2D), but cilia are still present; is proteolysis of Nek1 inhibited? What happens upon serum add-back and cilium reabsorption? Are levels of APC/Cdc20 decreased, or are APC/Cdc20 relocalized from the basal body? 1) Is the APC present at the centriole(s) of a quiescent cell that does not have a cilium? This is important because some components of the centrosome/cilium complex only localize to that complex after the cilium compartment is formed (the transition zone components, for example), and it would be useful to know the APC's relationship to other components in the pathway of ciliogenesis. Similarly, in Figure 1B, it is stated that Cdc20 is not observed at the centrosome of cycling cells. However, it I important to show that there is no accompanying axoneme (e.g., stained by acetylated tubulin). This would be necessary to make the claim that staining is centrosomal rather than at the ciliary basal body, as many cilia persist in non-mitotic interphase cells. 2) What criteria are used to conclude that the “branched axoneme” shown in Figure 5 under conditions of Nek1 depletion has the structure of a ciliary axonome, such as doublet microtubules, and is surrounded by a ciliary membrane? It looks like an internal microtubule array associated with the centriole, which could be an aberrant axoneme, but might be something else. The lack of Arl13b, cited by the authors as evidence that there is a signaling defect under these circumstances, might actually be due to this not being a ciliary axoneme. 3) Figure 1–figure supplement 1: APC is still active in quiescent extracts based on an assay performed with degradation of securin. This assay should be used in parallel with lysates depleted for Cdc20, to make it clear that Cdc20 is important for this function; and with lysates treated with pro-TAME, as a control. As presented, this assay lacks a negative control. Figure 1–figure supplement 2: Colocalization with the dynactin subunit P150 is used to demonstrate that the APC is associated with the mother centriole. This is not clear from the images in the Figure, because there is no marker of all centrioles. Ideally this experiment would be done with triple labeling for APC2, P150 and a marker such as centrin. 4) Figure 2A-C: This figure shows the change in cilium length associated with compromising APC-Cdc20. There is no indication of how the length of cilia was measured, and this is important because the length is used throughout the paper and in some cases the change is modest in amount. To determine cilium length accurately, the z-axis must be taken into account. 5) Figure 4A: According to the legend, “Cilia were visualized by acetylated tubulin staining (green)”. The legend should also mention the DAPI staining of DNA in all of the panels. More importantly, it is not clear what is shown in the ionophore panel. What is the yellow labeling, and why is it shown as yellow if the intention was to show the acetylated-tubulin in green? Is the signal from the normal complement of stable acetylated microtubules? 6) It is unclear why data on Aurora-A kinase are not shown, even though this kinase is known to be a proximal regulator of ciliary assembly that is localized to the basal body and targeted by the APC. The authors exclude Aurora-A by stating it is phosphorylated at S51 during ciliary resorption, protecting it from APC-mediated degradation. However, the cited reference does not indicate this information is contained in the paper. In general, the weakness of the data presented for Nek1 makes it important to examine at least minimally the interaction between Cdc20 and Aurora-A in this study. The authors could test this more directly by show effects of depletion or over-expression of Cdc20 on Aurora-A expression and localization to the basal body. a) As suggested by reviewers, the Cdh1 knockdown data including western blot to show knockdown efficiency and calculation of ciliary length were added (Figure 2–figure supplement 2A). The result shows that Cdh1 knockdown did not significantly affect the assembly of cilia, contradictory to the model by Miyamoto et al. proposing that APC-Cdh1 promotes ciliogenesis (Miyamoto et al., 2011). The work by Miyamoto et al. did not report any effect of knockdown of Cdh1 on ciliogenesis. b) We tried three different antibodies against Cdh1 for immunofluorescence assay (Figure 1–figure supplement 3), and none of them shows its localization to the basal body. The work by Miyamoto et al. did not report an immunofluorescence assay to show the cellular localization of Cdh1, which makes it hard for thorough comparison with our Cdc20 data. c) As suggested, we modified the data presentation in Results section for comparison of our work to the previous study. We also moved the data about dishevelled and Aurora-A to the main text (Results section), along with interpretation of the results. We appreciate this suggestion, and actually we tested the effect of overexpression of Nek1. The problem is that overexpression of Nek1 disrupted the overall cytosolic microtubule structure, leading to the total absence of ciliary structure, consistent with a previous study (Shalom et al, 2008). Thus, it is hard to study the effect of Nek1 on cilia with overexpression, although we did find that overexpression of a kinase dead version of nek1 also caused branched ciliary structure presumably due to dominant negative effect. a) We repeated the western blot in the new Figure 1–figure supplement 2E (Figure 1–figure supplement 2D in the previous version), and added time points post serum addition. It shows that the protein levels of Cdc20 did not change after serum addition. We also did the immunofluorescence assay, and showed that Cdc20 is still at the basal body during cilium resorption (Figure 1B middle panel). b) We suspect that some APC inhibitor protein might be involved in partial inhibition of APC-Cdc20 during cilium maintenance and fully activation of APC during ciliary resorption, as APC inhibitors act during both mitosis and meiosis. Indeed, our preliminary data showed that GFP-conjugated Emi2 was concentrated to the basal body of primary cilium, and transfection of cells with siRNA against Emi2 may reduce the ciliary length. However, unavailability of a good antibody against endogenous Emi2 for either western blot or immunofluorescence assay limits further investigation of Emi2 function during ciliogenesis. We did the corresponding experiment to answer these comments. Interphase proliferation cells were co-staining for Cdc20 and acetylated tubulin as requested. As shown in Figure 1B (lower panel), Cdc20 is not localized to centrosome in non-ciliated interphase cells. In addition, we showed that APC2 is not concentrated to centrosome in non-ciliated quiescent cells (Figure 1–figure supplement 2A). Thus, we concluded that APC-Cdc20 is only recruited to the basal body after cilium is formed. There are several evidence indicating that the branched structures are defective cilia. First, the branched structure does not appear in non-ciliated proliferating cells after nek1 knockdown (Figure 5–figure supplement 2C). Second, the assembly and disassembly of the branched structure follow the same dynamics as normal cilia: It assembles after starvation (Figure 5A), and resorbs after serum stimulation (Figure 5–figure supplement 2B). a) As requested by reviewers, we repeated the degradation assay in Figure 1–figure supplement 1, and added controls including the assay after Cdc20 depletion and the assay treated with proTAME respectively. b) To address the second comment, we co-stained quiescent RPE1 cells for P150 and centrin 1, and showed that P150 is localized to one centrin spot (Figure 1–figure supplement 2C), which is consistent with a previous report (Guo et al, 2006) showing that P150 co-localizes with mother centriole. This, together with the co-localization of APC2 with P150 (Figure 1–figure supplement 2B), support the conclusion that APC is localized to the mother centriole. In order to measure the length of cilia, during coverslip mounting, the coverslips were pressed hard against microscope slides to flatten most of the cilia. Only those cilia which were flattened into one plane were selected for image acquisition and length measurement. We added this description of length measurement in the Methods section. As suggested by reviewers, we have revised the figure legend (the description of DNA staining was added), and corrected the error in image processing in Figure 4–figure supplement 2 (in the previous version of the figure, we put the acetylated tubulin staining into both red and blue channel by mistake, causing the yellow color). a) We added additional experiment showing that the protein levels of Aurora-A did not significantly change after serum stimulation (Figure 5–figure supplement 1A), consistent with the result in the original paper revealing Aurora-A function in cilia (Pugacheva et al, 2007). b) As requested, we also did siRNA transfection and western blot, and found that Cdc20 depletion did not significantly affect Aurora-A protein levels during ciliogenesis (Figure 5–figure supplement 1B). c) We added the references indicating that Aurora-A is phosphorylated at S51 during ciliogenesis (Plotnikova et al, 2012), and that phosphorylation protects Aurora-A from APC-mediated degradation during mitosis (Littlepage and Ruderman, 2002; Littlepage et al, 2002). We also put the discussion about Aurora-A in the Results section. We wish to thank Dr Jagesh V Shah at Harvard Medical School for discussions and insightful suggestions. We thank Margaret Coughlin at Harvard Medical School for her effort to confirm the cilium phenotype with electron microscopy. We are grateful to the Nikon imaging center at Harvard Medical School and in particular to Jennifer Waters for technical support. The work was supported by a grant from the National Institute of General Medical Sciences, R01 GM039023. © 2014, Wang et al.